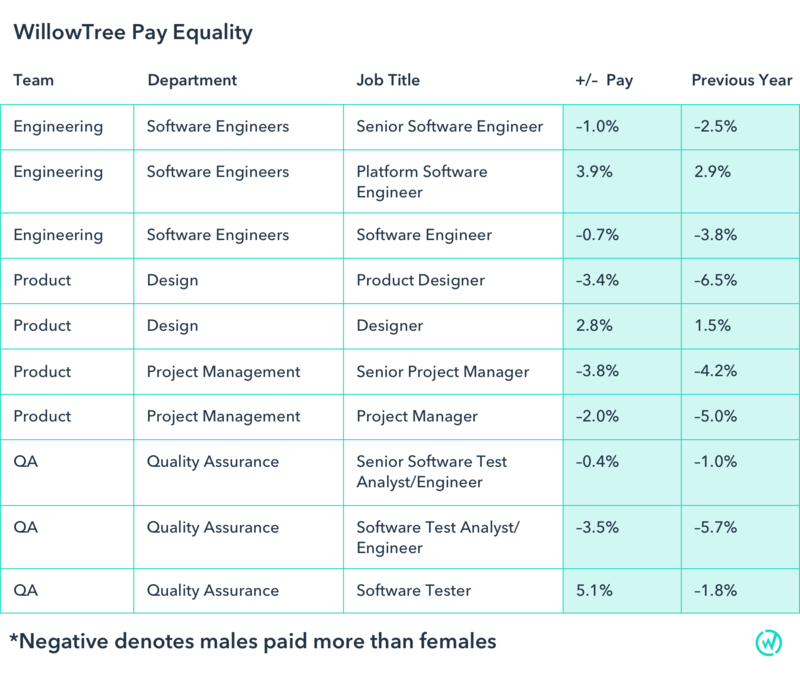 At WillowTree, we’re committed to compensating all employees with equal pay for equal work. Equal Pay Day is a great time to step back and look at how we’re actually doing in that regard, by the numbers. Transparency plays a huge role in staying accountable for achieving equal pay. As such, we’ve decided today to release our current pay discrepancies by position publicly. Going forward, we’ll make this a tradition to do on every equal pay day. In the graphic below, we have a pay analysis for the current quarter, compared to last year. Negative numbers mean women are paid less than men on average at that position, and positive numbers mean women are paid more than men. Note that we did not take other factors such as tenure and performance into account, so there will always be some discrepancy until we get to very large statistical team sizes. Overall, we are very very proud of where we are: salaries are within 5% at every job title, and in several areas women have higher average salaries than men. But there’s more work to do, and we will remain ever vigilant on this issue; we’re also aware that relative compensation alone is just one measure of ensuring everyone is being treated equally and given equal opportunities. We welcome the accountability of our peers in the tech space and encourage others to do the same.